HINT: If you don't see graphics/photos below, click the option to display them in your email viewer or click "View this email in your browser" at right. At the December 2015 CTHS public meeting, the annual board of directors election will occur. One seat is available at this time for a three-year term. Nominations are still open for this seat so please contact a board member if you are interested. This is certainly an opportunity for all members to â€œGet Involvedâ€ with your Cumberland Township Historical Society. The CTHS Preservation Committee has been attending the Central Adams Joint Comprehensive Plan (CAJCP) steering committee meetings. The CAJCP is holding these meetings to ultimately use its findings to set future land use policy. Our input is a key component of this process in terms of land preservation as it relates to the Cumberland Township Historical Societyâ€™s mission statement. CTHS Vice Chairman John Horner has already done significant ground-breaking work identifying historic sites in Cumberland Township. The CAJCP is in the process of developing interactive maps to address future land use and development. CTHS board member Doug Cooke is adding Johnâ€™s information to the preservation piece of CAJCPâ€™s mapping process. Soon that information will be available for all our members to view on the maps at the Adams County Planning and Development website. CTHS is committed to historic preservation, and this effort gives us a voice at the county level. We will make the CTHS preservation list available at the Societyâ€™s public meeting in December to anyone who is interested. Please remember that this is a work in progress. The interactive maps will also be available for viewing at one of the CAJCPâ€™s public outreach presentations, which will culminate in final draft form in April/May 2016. Mark your calendar for the December 7 CTHS public meeting at 7 p.m. featuring Jackie Whiteâ€™s program on Fantasyland. 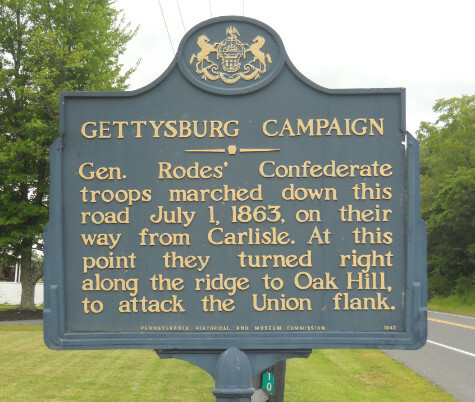 Correction on the Gettysburg Railroad article I wrote as the September CTHS column in the Gettysburg Times. Cumberland Township was founded in 1749, not 1849. Sorry! And thanks to Speros Marinos for the heads up on that. Many in Cumberland Township and far beyond are mourning the passing of CTHS member Philip Morey on August 21. Phil and his wife, Elsie, have been dedicated supporters of CTHS and active proponents of land conservation and historic preservation. 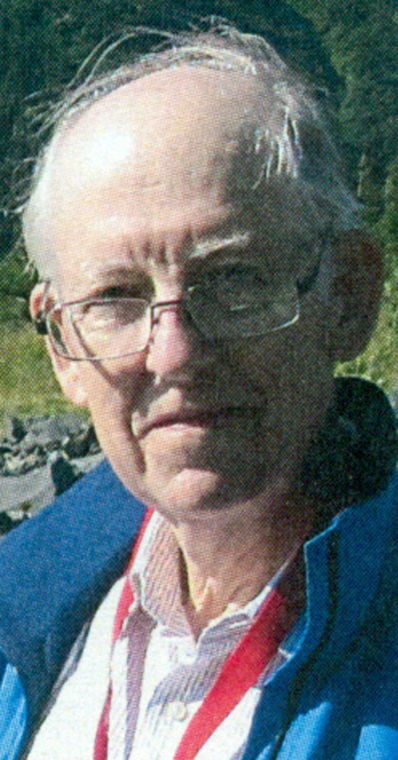 Philip R. Morey, 75, of Gettysburg died Friday, Aug. 21, 2015, at the Gettysburg Hospital. Born July 3, 1940, in Cleveland, Ohio, he was the son of the late Everett F. and Helen (Szabo) Morey. He is survived by his wife, Elsie D. Morey. Dr. Morey holds a B.S. in Biology from the University of Dayton and an M.S. and a Ph.D. in Biology from Yale University. He was certified in the Comprehensive Practice of Industrial Hygiene (American Board of Industrial Hygiene). 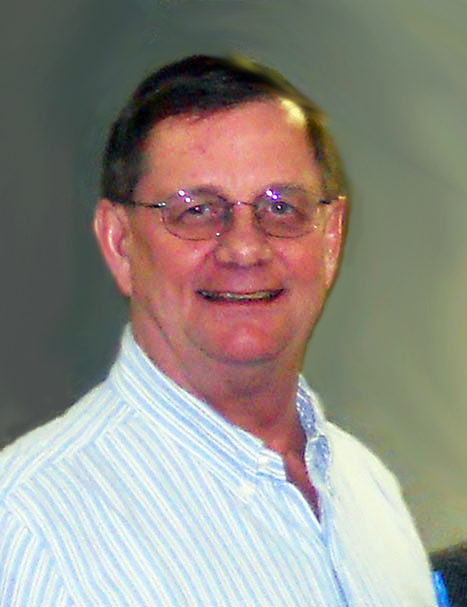 Philip had more than 30 years experience as an indoor air quality scientist providing expert analysis on microbial investigations and bio-contamination control. He was a frequent presenter to professional conferences and co-authored more than 200 publications. Philip held positions at Harvard University, Texas Tech University, the National Institute of Occupational Safety and Health, and Clayton Environmental Consultants and retired from Boelter-Yates, where he was Director of Microbiology. Dr. Morey was the author of â€œHow Trees Growâ€ and â€œBiological Contaminations in Indoor Environments.â€ Morey was elected to the International Academy of Industrial Hygiene Association for his distinguished service and significant contributions toward protecting the health and safety of people in the workplace and the community. Dr. Morey was a member of several professional societies: Sigma Xi, American Industrial Hygiene Association, The International Academy of Indoor Air Sciences, International Society of Indoor Air Quality and Climate as a founding member, the American Society of Testing and Materials, and the American Society of Heating, Refrigeration and Air-Conditioning Engineers, Inc.
Dr. Morey was a founding member of the Land Conservancy of Adams County, a McPherson member of the Historical Society of Adams County, and a member of the Gettysburg Battlefield Preservation Association. When Bob Angle and Wayne Twigg speak with awe and respect about the work of surveyors Charles Mason and Jeremiah Dixon, their words carry a lot of weight. Thatâ€™s because Angle and Twigg are surveyors, just like the famed Mason and Dixon. â€œWhat they did was a tremendous feat,â€ said Angle, who steps into the persona of Charles Mason to share a piece of history with others. In fact, thatâ€™s exactly what he and Twigg were doing when they spoke to those attending the CTHS public meeting on Aug. 24 and also at Mason and Dixon Day at the Mary-Penn Bed & Breakfast on Aug. 29. The two shared a detailed history of the surveying duo from 1761, when they observed the transit of Venus from Cape Town, South Africa, for the Royal Society of London, to their quest to determine the border between the colonies of Pennsylvania and Maryland. The Penns of Pennsylvania and Calverts of Maryland had disputed the dividing line for years, and the English Court of Chancery chose Mason and Dixon to apply their expertise where other surveyors had not been so successful. They arrived in Philadelphia to start their work on November 15, 1763. Mason and Dixon were among the best scientists of their day, Twigg stressed, and used their knowledge of astronomy and mathematics, along with state-of-the-art equipment, to take precise measurements. They were far from alone, though, with a survey crew of around 40 men. 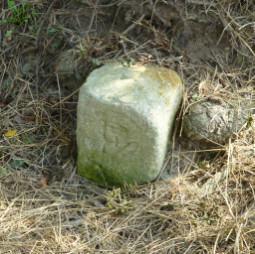 In addition to the survey work, trees had to be cut down on a 24-foot-wide path and holes had to be dug for the placement of limestone markers. The markers, Twigg said, arrived by ship at the port of Philadelphia and then traveled by cart to the site where they would be placed. That was no small feat, given that the crown stones, which were placed every 5 miles and were carved with the coats of arms of the Penn and Calvert families, weighed about 900 pounds each. Even the mile markers weighed several hundred pounds each. Visitors to Mason and Dixon Day at the Mary-Penn B&B were able to view two of those mile markers, shown below. The line runs diagonally through the home and across the property. 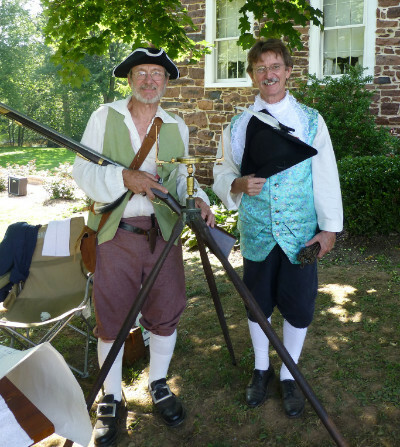 ABOVE: Bob Angle, left, and Wayne Twigg portray Charles Mason and Jeremiah Dixon at Mason and Dixon Day at the Mary-Penn Bed & Breakfast. BELOW: During the Aug. 29 event, visitors were able to take a hayride to view two Mason-Dixon mile markers on the property. ABOVE: Twigg, left, and Angle share information during the quarterly CTHS meeting in August. They also displayed some historic tools of the surveying trade. 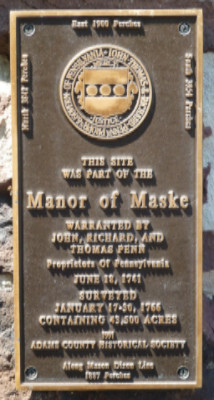 BELOW: A plaque on the Mary-Penn B&B declares that the site was part of the Manor of Maske, land allotted to William Penn. Plan to begin or renew your membership at the December 7 CTHS meeting! At the suggestion of the CTHS board of directors, I would like to share with our readers an experience I had recently. I bought a set of the Witness Tree artifacts from the CTHS â€œArtifacts Man,â€ Tom Clowney, with the intention of giving them away. Afterward, I didnâ€™t have any trouble finding three or four people to whom I owed a favor. I must say that, without exception, these gifts were enthusiastically received. One was to the man at the Verizon store who helps me, above and beyond the call of duty, when I have trouble with my iPhone. 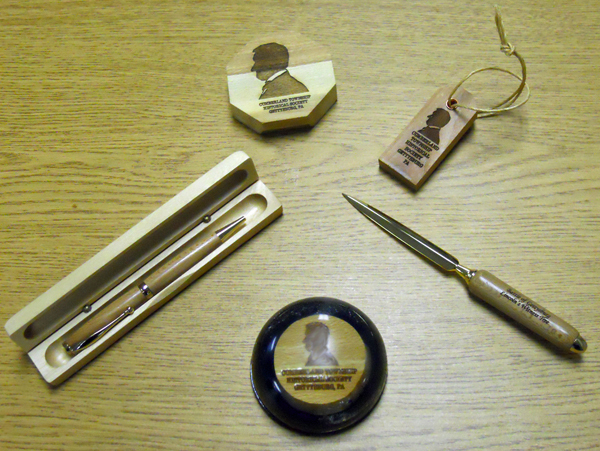 The handcrafted keepsakes shown below are made from a tree that witnessed President Lincoln as he rode toward the National Cemetery to deliver his Gettysburg Address. Give the gift of a pen, letter opener, magnet, paperweight, or ornament and support the Cumberland Township Historical Society. The items may be purchased at the CTHS quarterly meetings or by contacting CTHS member Tom Clowney at (717) 334-5406. PHMC encourages individuals, organizations, and agencies to nominate historic properties, people, and events for the Pennsylvania Historical Marker Program. One key criteria, however, is that the site, person, or event has statewide and/or national historical significance. 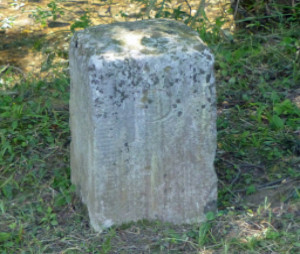 The first marker was erected in 1914, and the process continues to this day. In fact, PHMC has approved more than 20 new markers for dedication in 2015. Cumberland Township boasts its share of these informational signs, and The Courier will feature one in each of its upcoming issues. Thanks to CTHS member Mike Florer, who visited and photographed all the PHMC historical markers in the township, for contributing this idea and sharing his photos. BELOW: This marker was dedicated in 1947. Itâ€™s located on Route 34 (Biglerville Road) near the intersection with Herrs Ridge Road â€” about four-tenths of a mile north of where the CTHS public meetings are held. 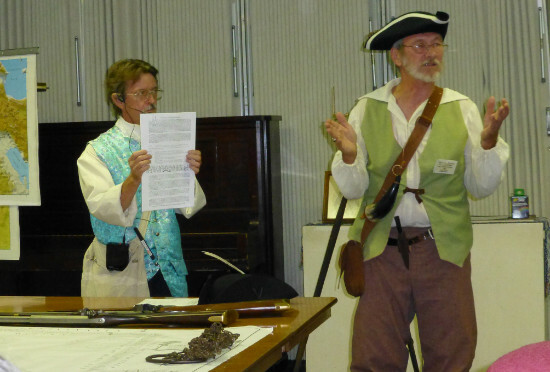 The Cumberland Township Historical Society holds quarterly public meetings, each featuring a special presentation on a specific aspect of the township's history. All presentations are free and open to the public. All events are held at 7 p.m. at the Church of the Brethren, 1710 Biglerville Road, Gettysburg, unless otherwise noted. Come and explore our local history! Dec. 7, 2015 â€” Get a glimpse of Gettysburgâ€™s long-ago theme park, Fantasyland, with presenter Jackie White. Watch your email for more information on this event about two weeks before the scheduled date. Details will also be posted on the CTHS website. 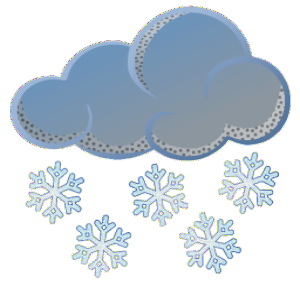 As we head into the winter months, the Cumberland Township Historical Society will follow the lead of the Gettysburg Area School District when severe weather strikes or is forecast. If the school district is closed on the day of a CTHS public meeting, that meeting will be postponed or cancelled. Copyright Â© 2015 Cumberland Township Historical Society, All rights reserved.